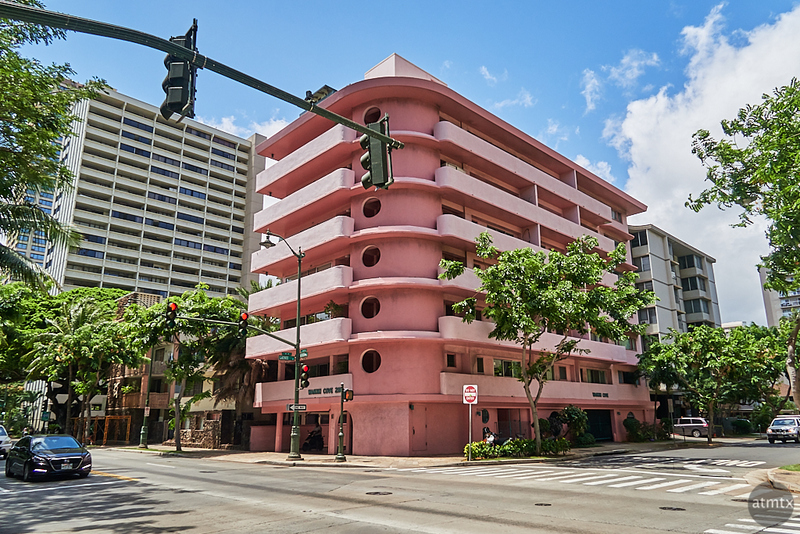 For my second find, I present this rather curvaceous and ugly pink apartment building on Kuhio Avenue. Kuhio is one of the major roads in Waikiki Beach and features rather modest buildings and businesses, especially compared to the high dollar Kalakaua Avenue. But things are changing. With the new Ritz Carlton residences and the re-done International Market Place, I see a shift happening. I don’t know anything about this building. It vaguely looks art deco, but without any of the typical detailing. Was it once a richly decorated building that’s been plastered over, over the years? It reminds me of something from Dr. Seuss. It does have one thing going for it. Unlike the new tall towers that tries to impress but ends up overshadowing the neighborhood, this pink apartment has a nice human scale, proportional to the street.